Most would agree that making a game at all is a great accomplishment, whether if it’s done with a handful of people or a company of hundreds. Of course, few have what it takes to design and craft a game all on their own. To do so would require a variety of skills, lots of time, and an abundance of passion. The following games were made by developers who had it in them to not only create a game by themselves but also make sure they were worth playing. And while some titles may have received a bit of help from a composer or artist, it’s nonetheless impressive how the main designers of these games took on many roles and tasks to get the job done. This puzzle platformer was made by Mike Bithell and first released as a Flash-based browser game in October 2010. Players take control of a small rectangle named Thomas (of course) along with his geometric friends, each of which offers different skills that help get them all to safety. Thomas Was Alone immediately captivated players via the simple visuals and absorbing storytelling, enough that it now can be played on more than eight different platforms. 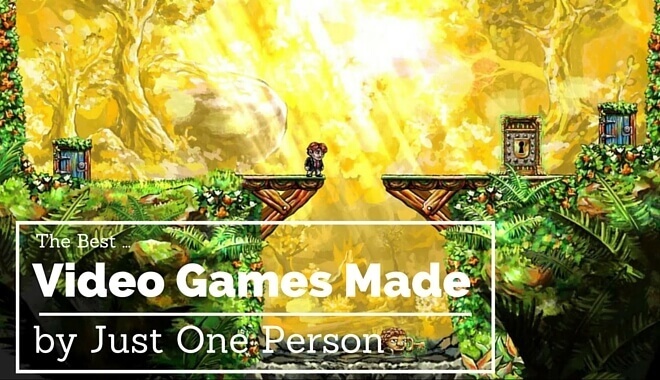 This new action-adventure game was developed by Tom Happ as a love-letter to the Metroid series. Acting as developer as well as artist and musician, Happ started this game in March of 2010 and didn’t finish until 2015. His time and effort paid off as Axiom Verge was praised for its cool bosses, great weapon variety, and interesting character upgrades. This gorgeous looking RPG was created by Dean Dodrill, a professional illustrator who happened to work on the Jazz Jackrabbit series created by Epic Games (then Epic MegaGames) in the early 90s. Although he did some outsourcing for the voice acting and music, Dodrill designed and programmed Dust: An Elysian Tale all on his own. Upon release it was met with praise for its stunning cartoon-like graphics, variety of environments, and fun side scrolling gameplay. Braid was among the first titles to release on a major video game console and also show the world that you don’t need a huge team to make a unique game. This puzzle platformer was actually completed by Jonathan Blow in 2005 but without the artwork seen in the final version. It nonetheless earned the Independent Games Festival game design award at the 2006 Game Developer’s Conference. Braid became a hit for its attractive watercolor graphics, enchanting music, challenging puzzles, and memorable ending. Over the course of five years Daisuke Amaya create this sidescrolling action-adventure game as a hobby. Little did he know that his project would end up amassing a cult following, leading to Nintendo itself doing their part to get an updated version released for the Wii and DS. Boasting classic 8-bit graphics, a catchy soundtrack, addicting gameplay, and more, the NES-inspired Cave Story felt just right on a Nintendo device sand can now be played on many other platforms. We won’t blame you if you think we added this game by mistake. One of the biggest and most successful games of the decade did in fact start out as a -one-man project, and that man was Markus Persson— or “Notch”. The Swedish programmer developed the original version himself back in 2009 and didn’t get any other help until after it released as an alpha version. The imaginative sandbox game quickly grew in popularity and its iconic characters can now be seen on T-shirts, Legos, spin-off titles, and soon, a film by Warner Bros.
Brian Provinciano designed this GTA-inspired game all on his own and launched it for PC in 2012. It received positive reviews for its hilarious parody of 80’s pop culture references and fun gameplay. Unlike a lot of one-man indie games, Provinciano even self-published physical copies of the game for both PS4 and PS Vita. Also notable is the fact that this 8-bit crime spree simulator has a world consisting of 8,000 by 4,000 chock full of easter eggs for games like Monkey Island, Super Mario Bros, and even the infamous Virtual Boy. It’s hard to imagine that the roller coaster simulator that started it all was made by one person by the name of Chris Sawyer. This Scottish game developer designed and programmed RollerCoaster Tycoon all on his own, which ended up earning Hasbro Interactive close to $180 million, with $30 million going to Sawyer. This classic simulator had a few sequels release in the following years that also managed to receive positive reviews. Arguably the most influential puzzle game in videogame history, Tetris was actually made in the summer of 1984 in what was once the Soviet Union. An artificial intelligence researcher by the name of Alexey Pajitnov spent some of free time writing games, including one inspired by a popular board game called Pentominoes. After a co-worker ported the game to PC, Tetris spread across the globe and is one of the most successful games of all time. Pajitnov still makes games; his most recent one being Marbly for iOS.